Natural toners. They cause so much confusion in our beauty routines. Does this actually do anything? The answer to questions 1 and 3 are absolutely yes, but question 2? Well that depends on your skin needs (and budget). Many natural toners offer a hydrating burst of freshness to the skin, imparting glow and softness when layered with oils and creams. Other natural toners can gently exfoliate and brighten the skin, creating a better canvas for oils and creams to absorb. So, you may need two types of natural toners. But for toner newbs, a hydrating, skin-softening toner is the easiest way to start. 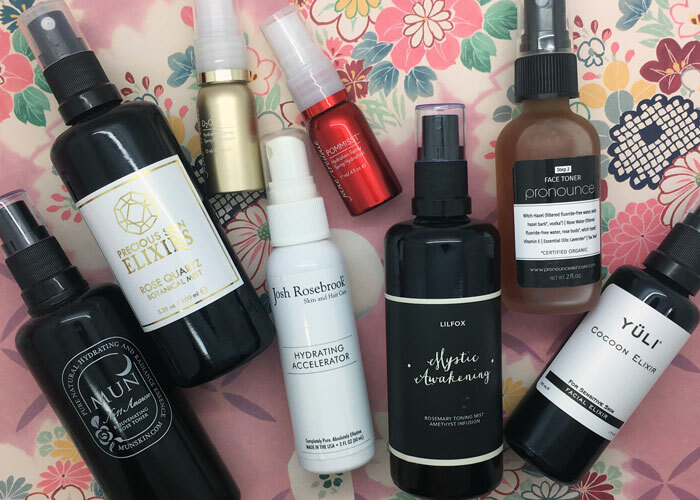 You’ll find both types of toners in the mini-reviews below — and there’s more to come as I continue to build out this guide. And when you’re ready for heavier-duty, acid-based toners, go here. Cocokind’s Organic Rosewater Facial Toner captures the most pure essence of rose that I have ever experienced from a bottle. Its lightweight, No. 1 plastic bottle disperses an extremely even mist of pure, beautiful rose hydrosol that makes my skin feel soft and refreshed and my mind feel calm and at ease. While it may not smell the best, Evan Healy’s Immortelle HydroSoul is an amazing toning mist for acne-prone skin. The ingredients in this toner are known for their ability to cool overheated skin — which is usually the root of breakouts. This is a toner I keep on hand (it’s easily available at Whole Foods) for when my skin is fussy and needs a break. An absolute must-have in your makeup kit, Jane Iredale’s Pommist Hydration Spray sets your look and provides a dewy, radiant glow to your skin. It hydrates, conditions and protects the skin thanks to antioxidant-loaded pomegranate extract. This is my go-to spray for keeping special-occasion makeup in place (I used it on my sister-in-law’s face during her wedding!) and one that’s wonderful to re-spritz throughout the day. Just as wonderful as the Pommist above, Jane Iredale’s Smell the Roses Hydration Spray delivers just-as-excellence makeup-setting power, but with the alluring scent of roses in every spritz. Made with organic rose damascena flower water, Smell the Roses Hydration Spray provides a boost of aromatherapeutic joy with every spray, and of course, keeps skin dewy, glistening and beautiful. It is without a doubt that Josh Rosebrook’s Hydrating Accelerator is a holy grail moisturizing toner in my collection. Hydrating Accelerator is the most calming, soothing facial mist I’ve ever used, helping to heal my skin from dryness, itchiness and flakiness while gently preparing it for deeper hydration from serums and oils. Its rich antioxidant and fatty acid content work in concert with the skin’s naturally protective acid mantle, keeping it safe from the elements. I reach for The Jasmine Garden the week before and during my nicest time of the month to help prevent breakouts and calm my anxiety. The skincare star ingredients in this mist are witch hazel, silver and caprylic/capric triglyceride, all known for their anti-inflammatory and skin-healing effects. Mun’s No. 11 Anarose Rejuvenating Rose Toner can easily be a morning or evening toner thanks to its extremely gentle and nourishing ingredients — think rose water, aloe leaf juice and moisture-binding hyaluronic acid. But for my skin, it really shines as an evening treatment, with pore-cleansing willow bark extract and calming florals, including Bulgarian rose, jasmine and daisy extracts. Each spritz brings a bouquet of roses and fresh-squeezed oranges to your senses, and there’s almost a touch of sweet honey as the mist dries and the scent rounds out. It’s perfect for spring and summer, because hello freshness, but it’s also one to keep during the cooler fall and winter months to remind yourself that roses and oranges are just around the corner. Stark Skincare’s White Willow Bark Perfecting Tonic refreshes my skin, cleans up trace amounts of makeup, dirt and oil and delivers an additional boost of acne-fighting power. It contains watermelon, grapefruit and lime extract, which are rich in Vitamin C. It also has cucumber, which is loaded with antioxidants and provides a cooling effect to freshly washed skin. Bretanna toners, which have a base of witch hazel, offer a combination of 1 and 2 because of witch hazel’s naturally astringent properties and the various Bretanna blends’ soothing ingredients that prep the skin for further products. While I’ve experimented with various witch hazel toners, I’ve found Bretanna toners to be the gentlest while offering a true toning, lightly astringent texture that leaves my skin feeling extra clean and ready for the next steps. Cecilia Wong has created an alcohol-free, probiotic- and herb-loaded toner that smells absolutely amazing. It’s got soothing chamomile in it to balance oil levels as well as rosemary, lavender and lemon to keep skin clean and fresh. All of these plants help create the alluring, fresh aroma that keeps me reaching for another spritz. This punchy formula, made with lemongrass oil, orange peel and lemon peel, offers an instant wake-up call to the skin, imparting a kiss of dew and aromatherapeutic effects. Obviously, if you’re sensitive to citrus oils, this isn’t the mist for you. If you’re concerned about phototoxicity, use this only at night (and do some research about phototoxic ingredients to see what you’re comfortable with). Natural anti-inflammatory, antibacterial and astringent-like ingredients blend with calming, soothing and antioxidant-rich ingredients to give Laurel Whole Plant Organics’ Facial Elixir for Oily to Combination Skin a balanced, refreshing texture. As you spray your face, the juicy-fresh elixir (that kind of smells like grapes to me?!) envelopes your skin in a nutrient-dense wetness that’s obviously saturated, yet not dripping or awkwardly wet. It’s definitely not a fine mist, but it’s not too targeted that it goes on in odd blotches. TATCHA’s Luminous Dewy Skin Mist seriously could have you second-guessing your facial oil addiction. My skin drank this mist up pre- and post-makeup application, and the mist delivered this glow that didn’t appear wet or messy. Just ripe skin that was lit from within.